Recently filed tax returns shed light on some of the dark money that flooded the campaign season. In the three years since Citizens United burst the dam on political spending by corporations, businesses have been flooding elections with cool, influential cash. Much of this money has remained secret, as corporations have eschewed donating through SuperPACs, which are required to disclose donors, in favor of channeling their money through opaque nonprofit entities, known as 501(c)(4)s, which can conceal donors’ identities. But now, thanks to recently released tax returns, we are beginning to learn just who some of the dark-money princes were in 2012 and how much money they spent. As the returns reveal, business interests were very busy during that election, quietly underwriting potent partisan activities that, more often than not, benefited Republicans. Among the biggest dark-money players was Americans for Prosperity, which dumped $122 million into various election and advocacy efforts. Founded and largely financed by the Koch brothers, the organization also drew undisclosed support from major corporations, according to tax returns and voluntary disclosures. As AFP hammered Obama with attack ads and sponsored an unprecedented get out the vote effort, the group quietly received donations from the tobacco products giant Reynolds American, from a business league of cable companies, and from the American Petroleum Institute, a trade group representing firms in the oil industry, including ExxonMobil, Chevron and the U.S.-subsidiary of TransCanada. And no wonder: one of the legislative priorities championed by Americans for Prosperity during the election, the REINS Act, would require Congress to approve every major regulation put forward by a Federal agency, from banking rules to clean air and beyond—a radical proposal that would be a windfall for AFP’s corporate backers. Another organization that received significant corporate backing was the American Action Network, a pro-GOP 501(c)(4) that blanketed mostly House races with negative advertising. During the election, the group covertly received $250,000 from the American Petroleum Institute, in addition to $1.5 million from the Pharmaceutical Research and Manufacturers of America, a trade group of multinational drug companies like Merck and Japan-based Eisai Co. All told, it spent $11.7 million to sway house races toward business-friendly candidates. Watching campaign commercials from the American Action Network, there was no indication on air or on its website that the group was financed by companies seeking government favor on a range of tax and regulatory issues. Both PhRMA and the American Petroleum Institute are consistently rated among the most active lobbying groups in the country. The ads, however, did not shy from staking out baldly partisan positions, with Republicans receiving the all the AAN love. One ad depicted three Democratic lawmakers running for re-election in California as Larry, Moe and Curly of the Three Stooges. Meanwhile, in House races in southern Illinois and in western New York State, the American Action Network spent more than $1.7 million dollars in mailers and advertisements to help the Republican candidates. In each race, the Republicans won by a margin of less than 1.8 percent. While donations to large, multi-industry efforts like Americans for Prosperity proved popular among some business interests, others took a more targeted approach. Take the Keystone XL, the sw pipeline project that critics say would both pollute the surrounding environment and deepen the climate crisis by expanding the use of “dirty,” tar-sands oil. This commercial was sponsored by the American Energy Alliance, one of the many 501(c)(4) election groups that refused to disclose its donors. But what viewers had no way of knowing was that the ad was paid for in part by a group of companies with a financial interest in profiting from the pipeline. As a tax document filed earlier this year shows, the American Energy Alliance received nearly $900,000 from a business league of oil refinery companies. These companies include Marathon Petroleum, Phillips 66, Valero Energy and Motiva, a company jointly owned by Shell Oil and Saudi Aramco, the Saudi national oil company. All four companies own Gulf Coast refineries that are reportedly preparing to refine tar sands oil from Canada if the Keystone XL is approved. Meanwhile, as these companies were funding Energy Alliance to push their interests, the National Mining Association was busy channeling $3.9 million from its member companies—Alpha Natural Resources, Consol Energy, Cloud Peak Energy and Patriot Coal, among others—into a program called “Count on Coal.” This program placed 150 billboards in six battleground states and developed materials for mobilizing voters against Environmental Protection Agency policies affecting the coal industry. Three weeks before the election, NMA president and CEO, Hal Quinn, e-mailed coal companies to remind them that “surveys have shown that employees consider their employers to be a reliable and trustworthy source of information about issues and candidates,” and to “begin talking to your employees about what’s at stake this fall.” A pamphlet sent out by the group to workers at various coal firms included endorsements for Mitt Romney and a slate of mostly Republican candidates for Congress. Count on Coal’s pre-election videos featured warnings about “Obama’s war on coal,” highlighted a positive message from Romney, and ended by stressing the importance of voting. The effort, according to a 2012 NMA tax return, was handled by the public relations firm, Weber Merritt Strategies. Other industries took a more subtle approach to shaping the election discourse. A recent disclosure also reveals that the Private Equity Growth Capital Council paid the Glover Park Group to help rebuff campaign-related attacks on the private equity industry. The Glover Park Group is a public affairs firm founded by former Clinton administration officials. After Newt Gingrich, followed by Obama and his allies, stepped up attacks on Romney’s days at Bain Capital, alleging that Bain’s business strategy often destroyed jobs, Glover Park stepped in with positive messages in the media about private equity and its role in local communities. It’s worth noting that this publicity effort, which tax forms show cost over $1 million dollars, did not include ‘vote for’ or ‘against’ language, meaning it went on without any form of campaign disclosure. Similarly, none of NMA’s employee-focused advocacy required FEC registration. If all these examples suggest that the Republicans received the majority of dark-money donors’ largesse, it’s because they did. Yet Democratic secret money groups were not left completely wanting, according to the Center for Responsive Politics. So far, the Alliance’s bipartisan strategy seems to be working. A bill strongly favored by the Alliance which modifies the Medicare reimbursement rules for nursing centers, is now co-sponsored by a number of Tea Party and progressive lawmakers. In contrast, a bill that aims to shed light on the secretive dark-money world hasn’t garnered such support. 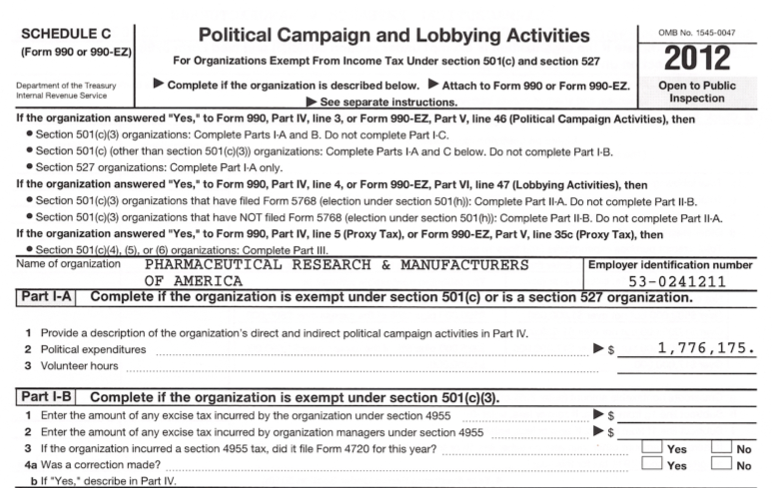 The DISCLOSE Act of 2013 would, as the name suggests, disclose the donors to 501(c)(4) political groups as an election unfolds. Though the act wouldn’t hamper the flow of corporate cash into elections, it would nonetheless be a marked improvement over the current system, which allows only for a partial view of donors one year after an election concludes. And yet, even this modest effort can’t get traction. The bill, proposed by Representative Chris Van Hollen (D-MD), was sponsored ten months ago and appears unlikely to receive consideration. Read Lee Fang on the fracking industry’s expensive, disinformation campaign.